Home Companies Wuhan Meir Heng Mechanical And Electrical Co., Ltd.
1. 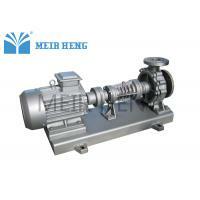 RY heating oil centrifugal pump is a new type of hot oil transmission pump, it is widely used in the outdoors. It is made of high quality cast steel alloy. it is mainly used for conveying weak corrosive liquid without particles, is a kind of ideal transfer pump for heat carrier medium. Different materials are available for customer's choice. The basic structure form is single stage single suction cantilever foot support structure, the inlet of the pump is axial suction, the outlet is the center vertical upward, together with motor, they are installed on the common base. Long shaft and heat diffuser design between the pump casing and motor ensure the heat resistance ability of the pump. 2. It can be equipped with explosion proof motor, gear box motor, used in indoor. also can be equipped with diesel engine, used in outdoors. 3. The sealing of pump combines packing seal and mechanical seal, the sealing performance is enhanced by adopting a lip seal poly-tetrafluoroethylene (PTFE). The corrosive resistance ability is 25 times greater than that of the rubber seal, strongly ensures the sealing performance under high temperature and condition. 4. The highest liquid temperature can reach to 370 degree celsius. 5. This pump can customized a vertical pump. The advantage is that the installation space can be saved. It is mainly used for heat transfer oil, heat conduction oil, chemical, rubber, plastics, pharmaceutical, textile, printing and dyeing, road construction, food and other industries.